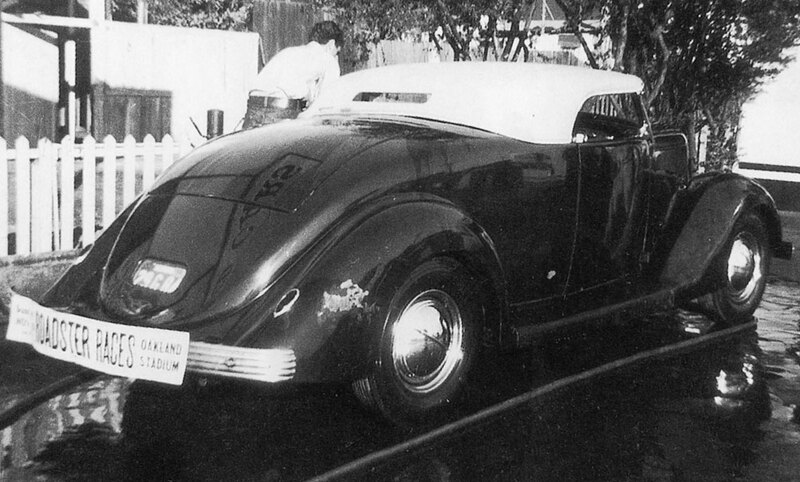 Restyling this car in the 1940 would have an impact on the custom car scene forever. 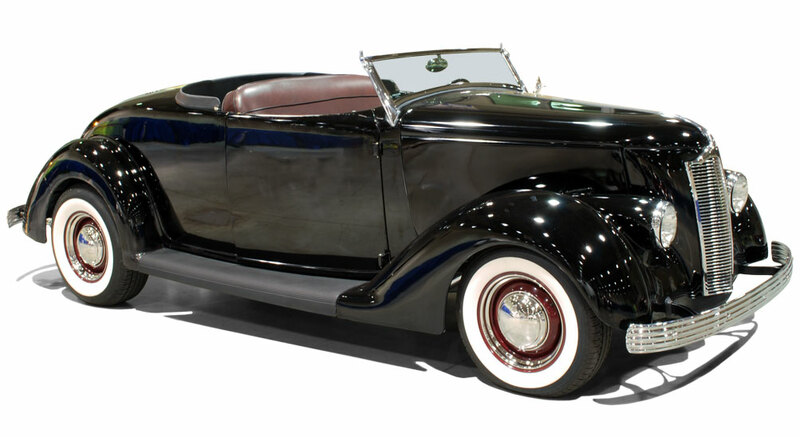 The term “Harry Westergard style” came from the looks Harry achieved for this 1936 Ford. 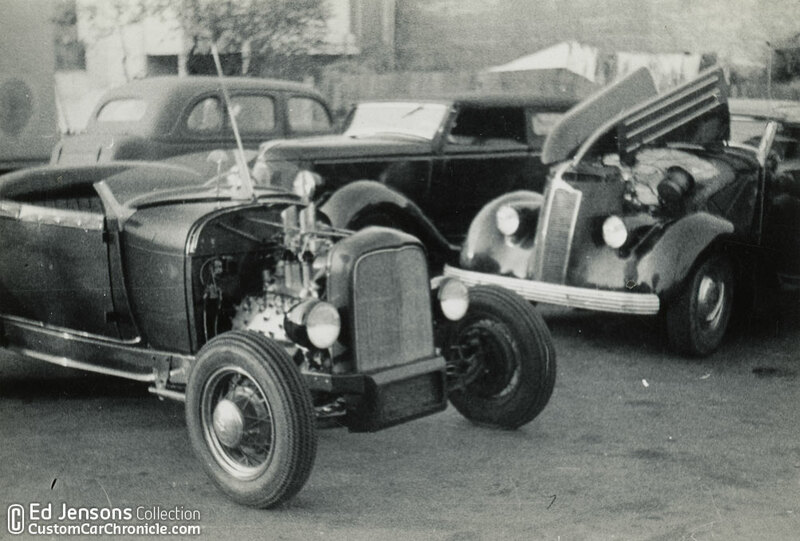 Gene Winfield took this photo of the 1936 Ford in the parking lot of a NorCal circle track. Interesting to see the side window curtains installed. Most likely because it was winter time when Gene took the photo. Ed Jensen was most likely already the owner of the car when this photo was taken. Most of the photos in this article come from the Ed Jenson Collection. They were shared by Tim Cunha and scanned by Curtis Leipold. 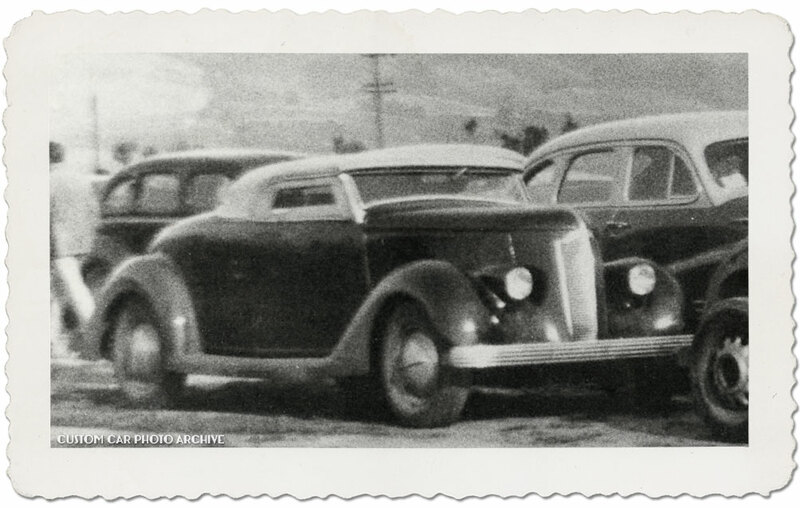 More amazing photos from Ed Jensons 1940’s photo collection can be seen in the Ed Jensons Custom Car Chronicle section. The Ford parked in front of Ed Jensen’s house. 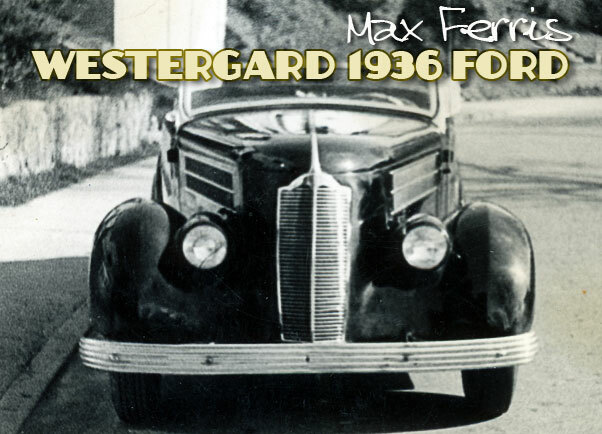 arry Westergard customized this 1936 Ford Roadster for Max Ferris in the early 1940’s. 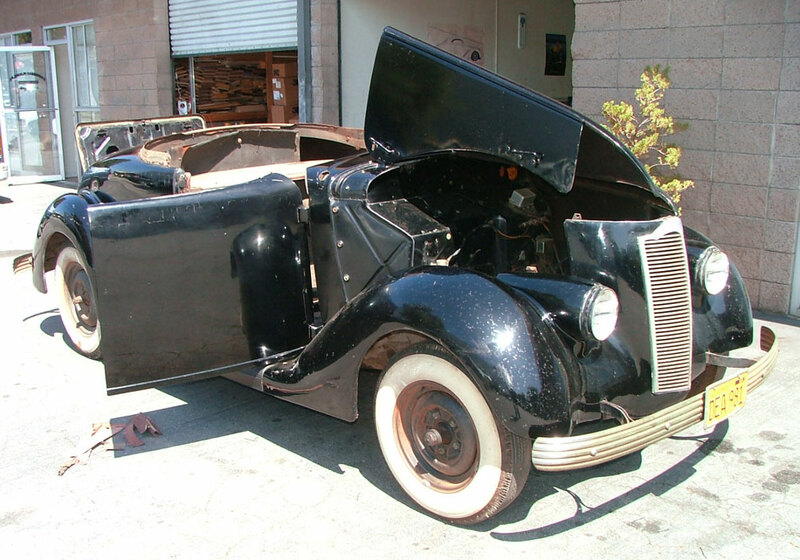 Harry Westergard was the best in reshaping an “ordinary” Ford into an exclusive automobile. 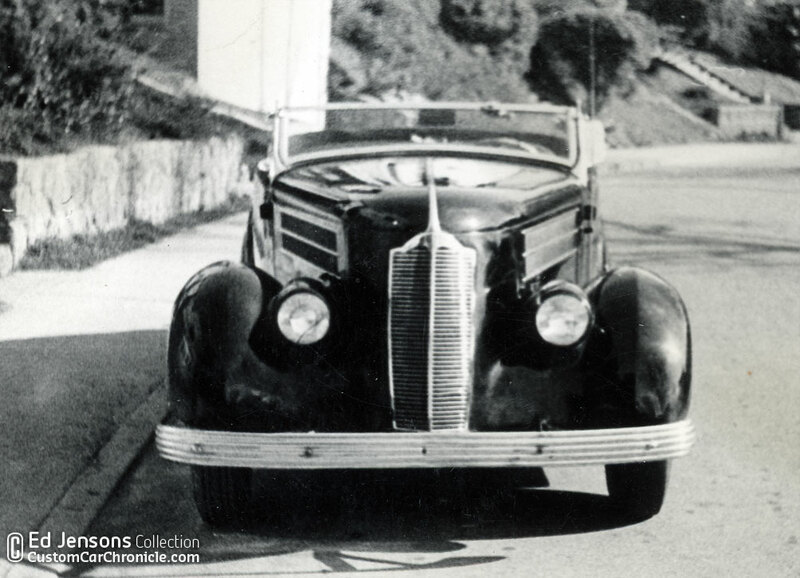 The Packard grille was one way, and, combining it with the long 1939 Buick headlights molded into the front fenders made it an instant winner. 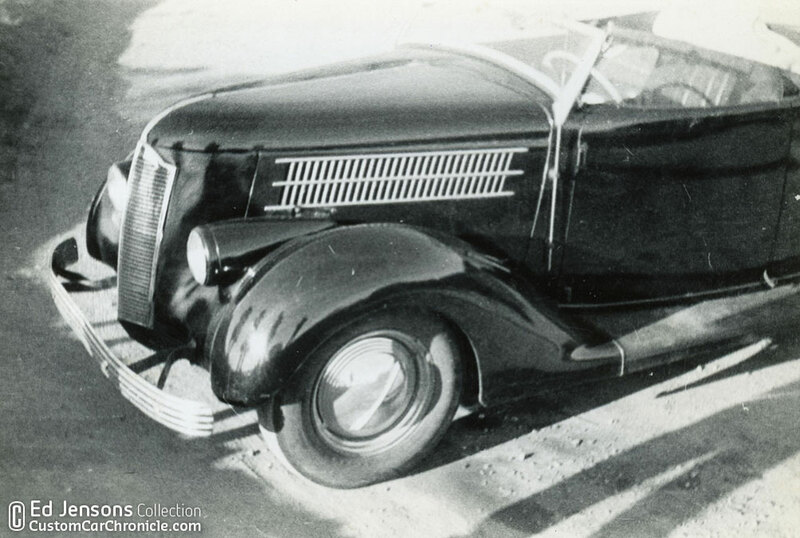 The Packard grille was found on a roll-over car at a local wrecking yard and was installed in a hand-shaped panel filling the stock grille opening. The front fenders were welded to the grille surround making the front piece one single unit. For the first version, the hood sides remained stock, but later on a set of smooth hood sides were installed, to clean it up even more. Harry chopped the windshield post and a padded top was constructed. To clean up the car and add some more class to the Ford, Harry filled in the complete belt line from the cowl all the way to the back, creating one smooth body. All of the handles were shaved and the holes filled. 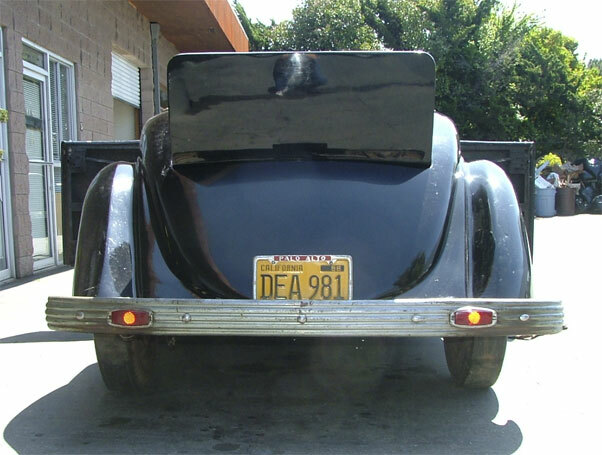 The taillight stands were removed, the holes filled and 1939 Ford “teardrop” shaped taillights installed. A small rectangular hole with round corners just big enough to show the license plate numbers was cut into the panel below the trunk. The plate was installed from inside the car and sat behind a glass plate. 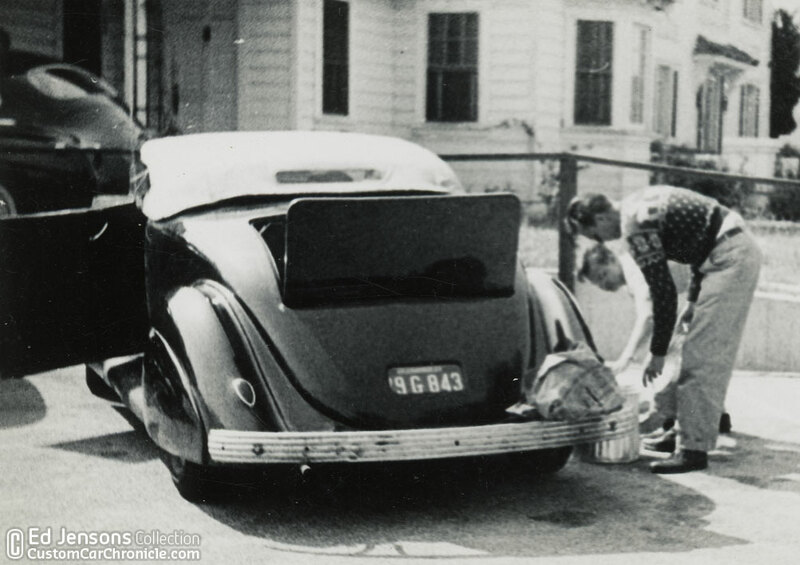 These set-in license plates were a big trend in the 1940’s. 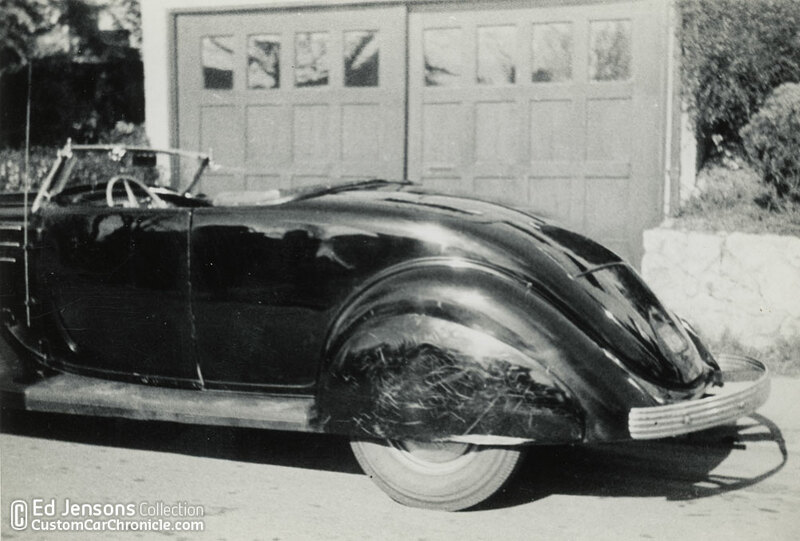 Harry installed a set of 1937 DeSoto bumpers. It is interesting to see that Harry used a front and rear bumper on the car, while most customs only use the much flatter front bumper on both sides. The much rounder rear unit actually looks very good on Max’s car. Most likely the car was painted a maroon at first and later being repainted forest green. Packard Clipper grille and lowed headlights really improve the looks of a 1936 Ford. The Ferris Ford used a chrome plated dash with a 1941 Mercury gauge cluster and upside down Lincoln steering wheel. This and a few of the other photos show that these cars were daily users, and small mishaps happened. 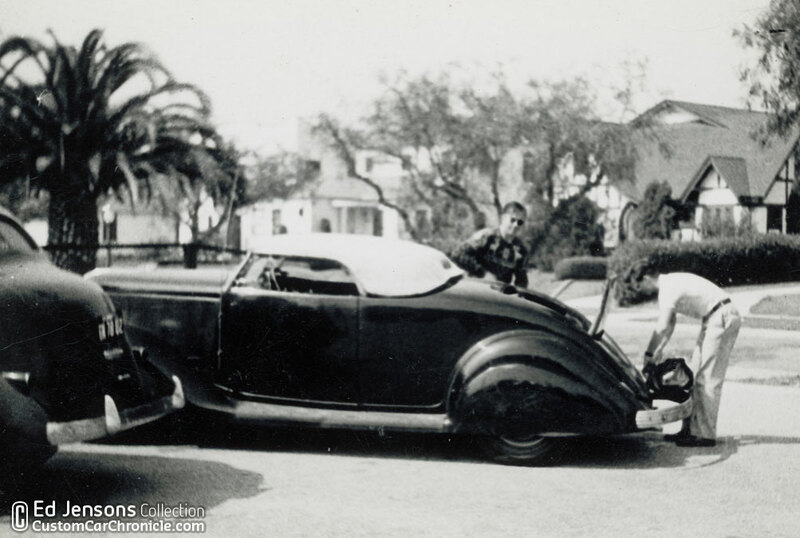 Notice the round 1937 DeSoto rear bumper. A good look how Harry installed the Packard Clipper grille and Buick headlights. Fantastic early 1940’s photo from the Ed Jensons Collection showing the roadster on the far right. But the main focus from the photographer in this photo was the Hot Rod. The Hot Rod is Jack Davis/Calori roadster, not long after Jack Davis sold it to Jack Calori. A 1929 Model A Roadster on a 32 Ford frame with the cut down 32 Ford grille and with the home made V-style windshield and a hopped up engine with two carb intake is a really great sample of early 1940’s Hot Rods. 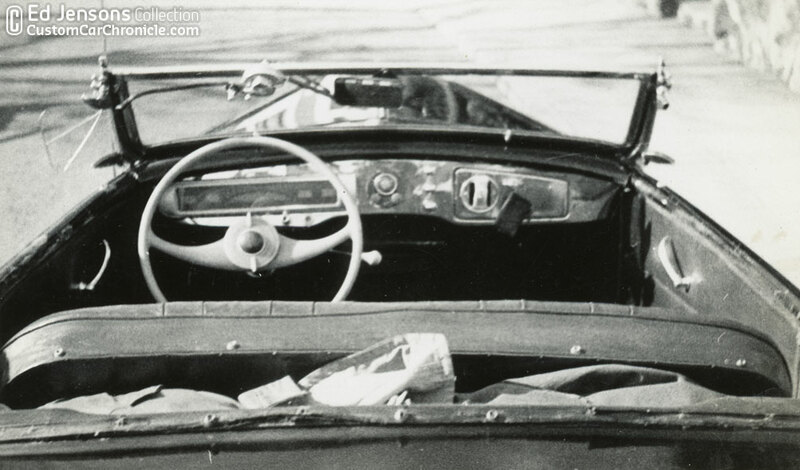 Enlarged section of the photo shown above shows Ed’s Roadster a bit more up close. The stock hood sides are now replaced with a set of smooth units. The shape of the padded top is perfectly proportioned. Here we can see Ed and a friend packing some stuff for one of their many road-trips in the car. 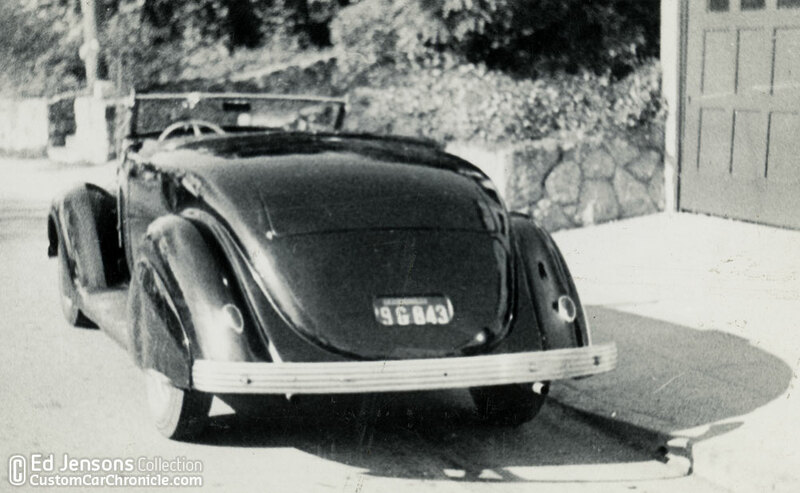 In this photo we get a good look at the ’39 Ford taillights and set in license plate. On one of the many trip something must have broken down. The photo above and the one below are also taken by Gene Winfield. 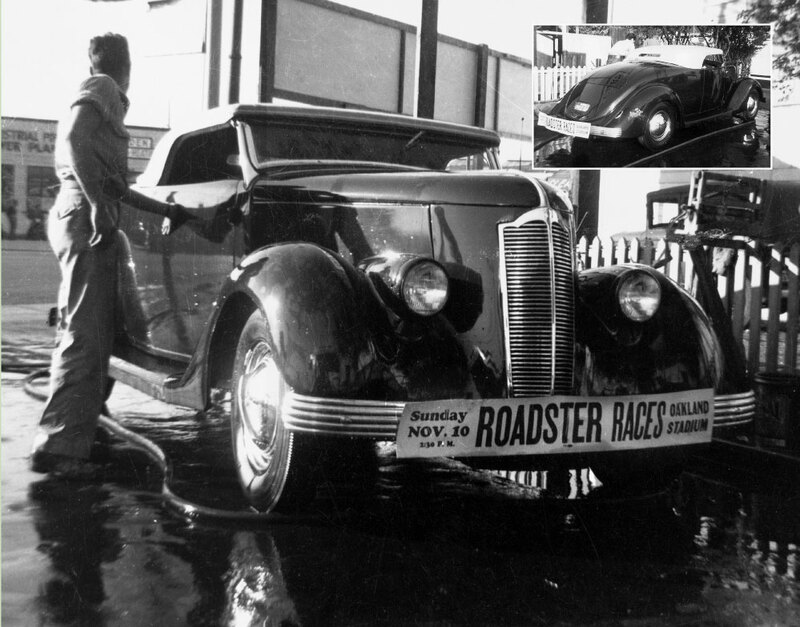 The roadster was used as rolling advertising for the Roadster races at the Oakland Stadium. Ed knew the promotor of the show and had offered to help promote the event for him. 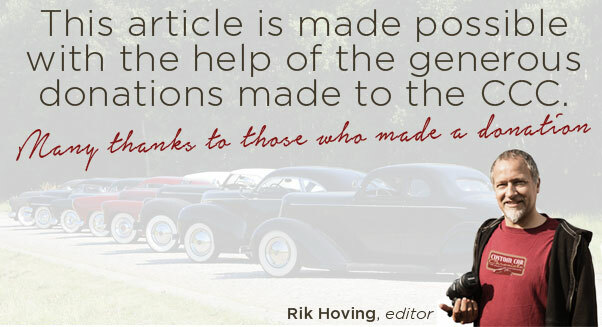 Max sold the car to Ed Jensen who owned the ’36 Ford for quite some time. Ed later sold the car to a guy who lived on the other side of the bay and the ended up over there. When Ed talked to Tim Cunha about the 36, he was not sure about the name of the guy he sold the car to, but possibly this was Larry Chubbick, but it could have been somebody before Larry as well. when Larry Chubbick owned the car he removed the skirts, and changed the suspension, to give the car a slight forward rake. Larry also added a lot of speed parts and a Colombia 2-spped rear axle. Larry used the car as his daily driver and as some of the photos show it started to show signs of being well used. At one point Larry respainted the car in Cinnabar Red. In 1949 Vern Simons bought the car at a used car dealership. By then the rear fenders had been smoothed and a set of 1941 Chevy taillights mounted on the DeSoto bumpers. 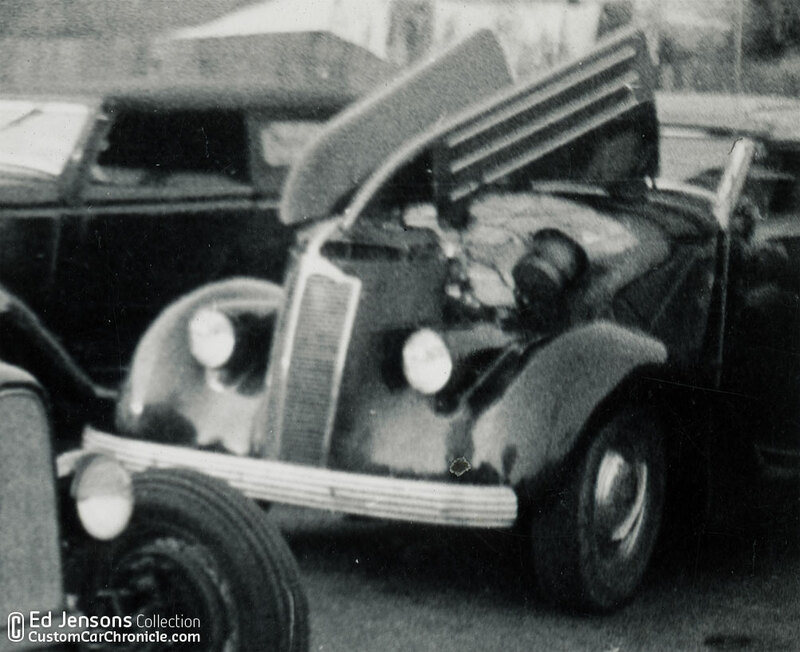 In 1949 the ’36 Ford had seen a lot of road use and needed a full restoration. Vern hired Lyle Barteles from San Francisco to do the lead work on the car. Vern painted the car in black and had Hall of Oakland redo the padded top. 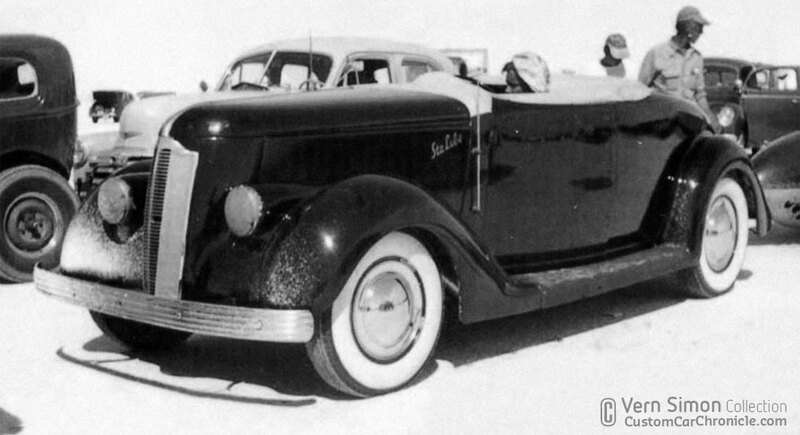 In 1952 Vern took his 1936 Ford to Bonneville to race it. The team struggled a lot but eventually Verne managed to get a speed of 119.52 on his tag. 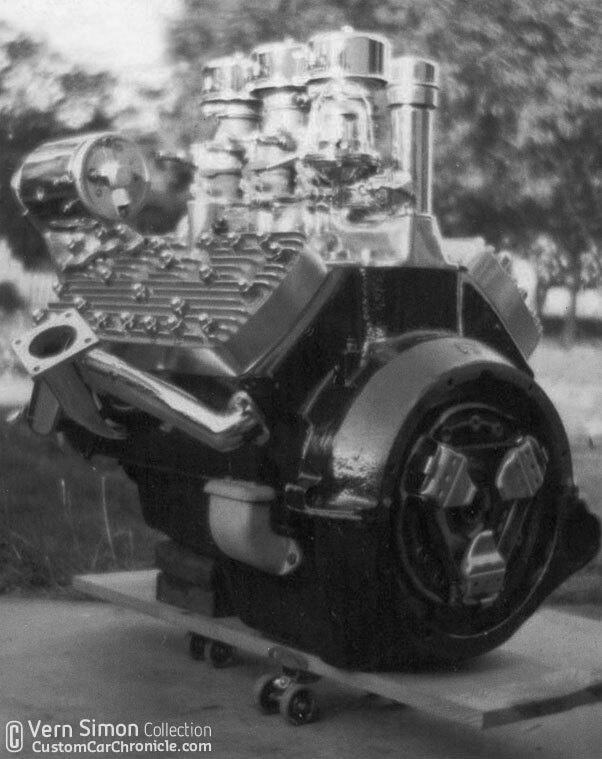 The reworked engine, Vern took a snapshot moments before it was reinstalled in the car from the trip to Bonneville in 1952. 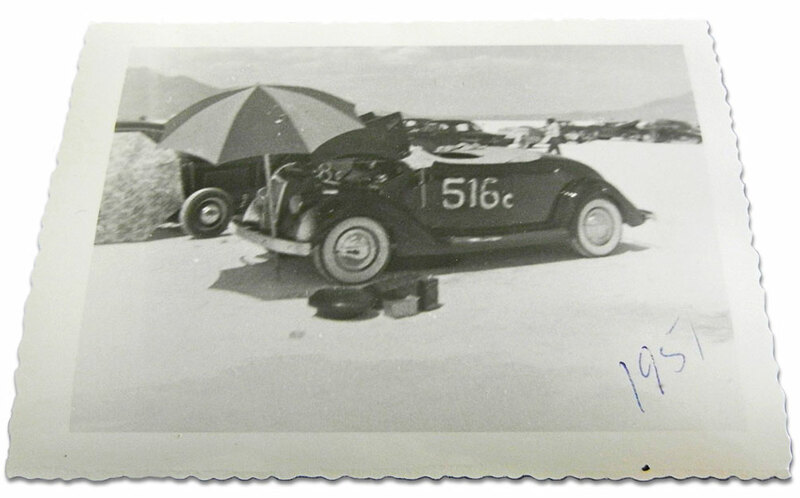 This photo of Vern’s Ford at Bonneville was listed on eBay some time ago. The 1951 date written on it should be 1952. When Vern Simons bought the car of the car lot he had no idea where it came from, or who built it. When the Rodder’s Journal did an article on Vern’s unrestored Roadster in issue No. 19 Vern found out much more on the history of the car. But one of the missing links, Ed Jenson, came into the picture after Tim Cunha recognized the roadster in the RJ article from the amazing photos in his friends Ed Jenson’s collection. So Tim made sure Ed and Vern met each other and were able to share many memories about the car. Vern still owns this early Westergard custom. After the car had been in storage and photographed for the Rodder’s Journal article, Vern decided it was time to start restoring the car. He choose the Foley bros. Custom Works shop in Redwood City to start the restoration around 2009. 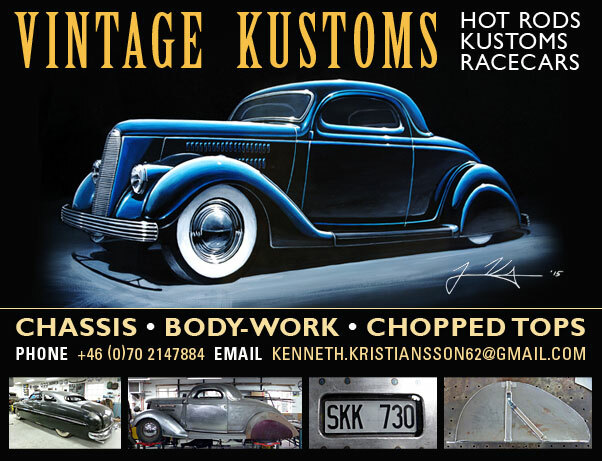 In 2011 Vern Simons was invited to show his 1936 Ford Roadster built by Harry Westergard at the GNRS Customs Then & Now show. The car arrived at the show in a slightly street rodded version. But after spending the weekend at the show, surrounded by nothing but Custom Cars, Vern came to the conclusion the car needs to get back to the full Custom style as it was intended by Harry Westergard in the early 1940’s. Vern’s Ford parked in front of the Foley bros. Custom Works shop during the start of the partial restoration. 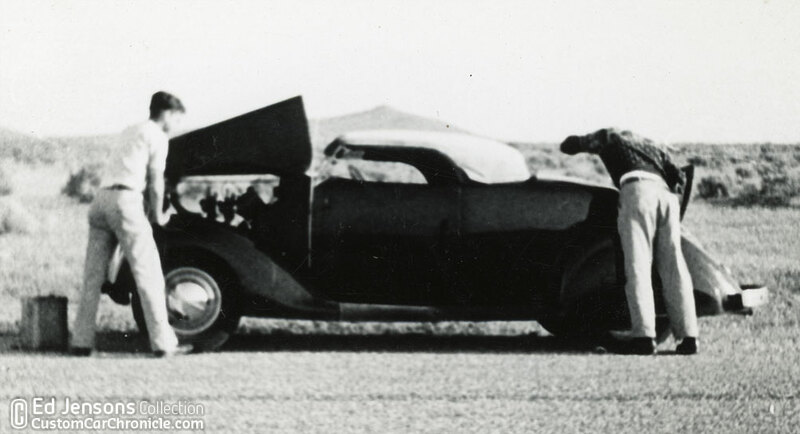 This photo shows the smoothed rear fenders and 1941 Chevy taillights mounted on the DeSoto bumper. This is how Vern Simons got the car. Vern’s Ford how it looks while it was shown at the 2011 GNRS Customs Then & Now exhibit. I like the solid hood side, padded top installed, livery. do you have any other photos of it. I believe it could be another Westergard effort? 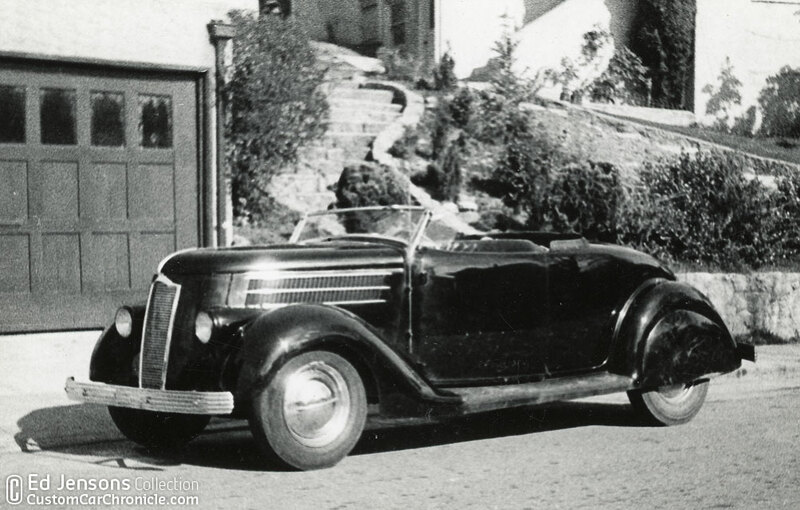 David, I wish I had more photos of that Convertible Sedan with the ’39 LaSalle grille. But sadly this is the only photo in the collection that shows this car. And yes it could very well be another Harry Westergard restyled car. 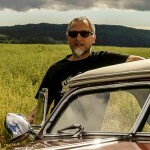 Fantastic photos once again Rik, your archive is just amazing, a real tribute to a true Kustom enthusiast. I spent a lot of time looking at this car there.